From tiny to gigantic, from drab to remarkably beautiful, from harmless to venomous, lizards are spectacular products of natural selection. This book, lavishly illustrated with color photographs, is the first comprehensive reference on lizards around the world. Accessible, scientifically up-to-date, and written with contagious enthusiasm for the subject, Lizards: Windows to the Evolution of Diversity covers species evolution, diversity, ecology, and biology. 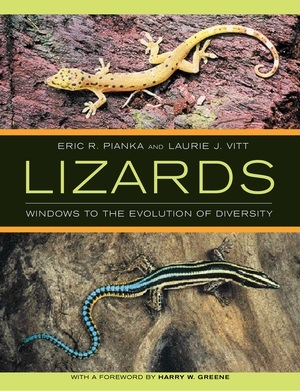 Eric R. Pianka and Laurie J. Vitt have studied and photographed members of almost all lizard families worldwide, and they bring to the book a deep knowledge based on extensive firsthand experience with the animals in their natural habitats. Part One explores lizard lifestyles, answering such questions as why lizards are active when they are, why they behave as they do, how they avoid predators, why they eat what they eat, and how they reproduce and socialize. In Part Two the authors take us on a fascinating tour of the world's manifold lizard species, beginning with iguanians, an evolutionary group that includes some of the most bizarre lizards, the true chameleons of Africa and Madagascar. We also meet the glass lizard, able to break its tail into many highly motile pieces to distract a predator from its body; lizards that can run across water; and limbless lizards, such as snakes. Part Three gives an unprecedented global view of evolutionary trends that have shaped present-day lizard communities and considers the impact of humans on their future. A definitive resource containing many entertaining anecdotes, this magnificent book opens a new window to the natural world and the evolution of life on earth. Eric R. Pianka is Denton A. Cooley Centennial Professor of Zoology at the University of Texas, Austin. His books include Evolutionary Ecology (sixth edition, 2000), The Lizard Man Speaks (1994), and Ecology and Natural History of Desert Lizards (1986). Laurie J. Vitt is a George Lynn Cross Research Professor (Zoology Department) at the University of Oklahoma and Associate Director of Collections and Research at the Sam Noble Oklahoma Museum of Natural History. He is coauthor of several books, including Herpetology: An Introductory Biology of Amphibians and Reptiles (second edition, 2000). Pianka and Vitt are also coeditors of Lizard Ecology: Historical and Experimental Perspectives (1994).